The Gray Tree is an oil on canvas by Piet Mondrian in 1911 when Mondrian was trying to experiment with Cubism. Piet Mondrian was a world-renowned abstract master whose most famous works are abstract paintings of colored squares, rectangles, and thick black lines. He was an important contributor to the De Stijl art movement and group. The Gray Tree is a masterpiece which Mondrian took cues from Braque and Picasso, however Mondrian had merged his artistic style with his spiritual pursuits, it’s about as expressive that way as he’d ever be. It’s a Cubism painting that reveals Mondrian’s application of Cubist principles to represent the landscape and early transition toward abstraction. He painted interlocking blocks, which form together in the shape of a tree. 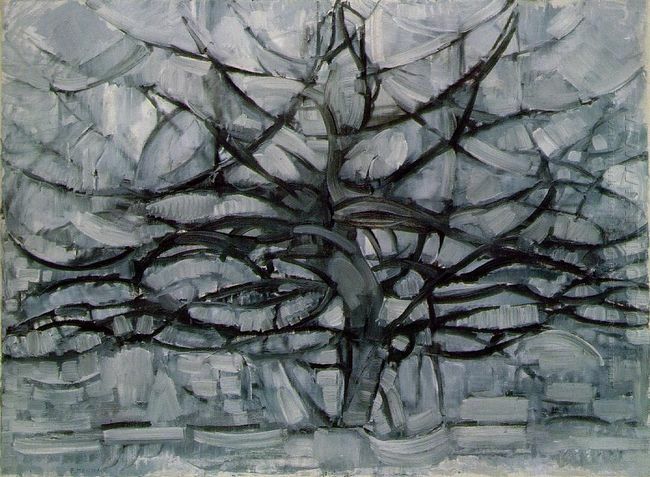 Mondrian reduced the three-dimensional tree to lines and planes using a limited color of grays and black. By using basic forms and colors, Mondrian represented the tree naturally. He simplified the subjects of this artwork down to the most basic elements, the pure primary colors and flatness of forms, choosing to distill his representations of the world to basic vertical and horizontal elements. He showed a very true and lyrical balance in this landscape painting. Mondrian believed that art reveals the underlying spirituality of nature. Although Mondrian used to painting these pictures for a living, believing the delicate elegance that these paintings showed was very rare, his greatest desire to achieve the most pure realm drove him to seek the most honest part of the art.